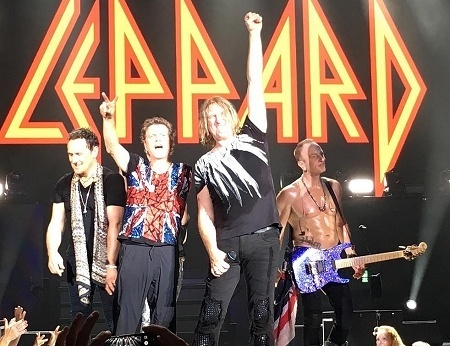 Def Leppard played a 2016 Summer Tour show last night in St. Louis, MO with 17 songs performed. The show took place at the 20,000 capacity Hollywood Casino Amphitheatre. 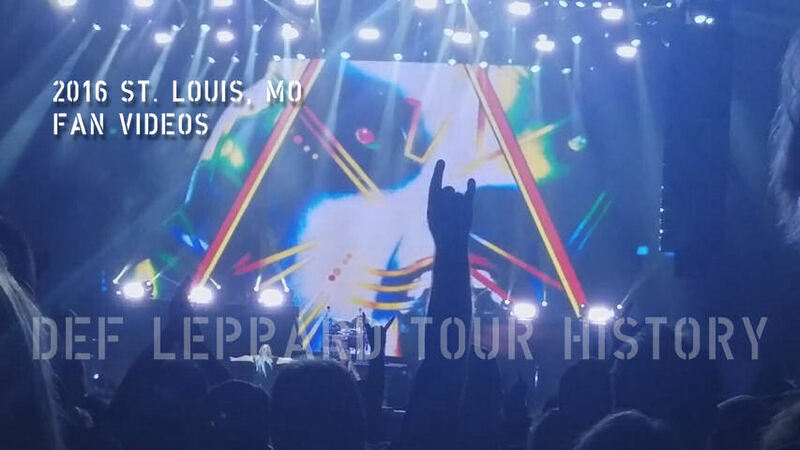 The band's first time in St. Louis since 4th September 2015 on the 2015 world tour. The 17th show the band have played in St. Louis and 10th time at this outdoor venue. The first visit here took place in June 1980 at The Checkerdome as support to Ted Nugent on their first American tour. They returned in October 1981 to play the Kiel Auditorium with Blackfoot. Their first headline show in the city took place in August 1983 during the Pyromania tour at The Checkerdome. Two "One-End" shows followed in February and October 1988 at the St. Louis Arena on the Hysteria tour. The In The Round stage was arranged at one end of the venue due to weight restriction issues. The February show was filmed by an audience member. An In The Round show was played at the same arena in December 1992 on the Adrenalize tour with their new lighter stage rig. The first show at last nights venue took place in August 1993 on the same tour under its original name of Riverport Performing Arts Center. This started a run of seven shows played at the venue under four different names in 1993, 1996, 2000, 2006, 2007, 2009 and 2011 by which time it was called Verizon Wireless Amphitheater. The August 2012 Rock Of Ages tour show with Poison saw them return indoors at the Chaifetz Arena. The Verizon Wireless Amphitheater was played again in August 2014 before last years show was the first under the current name of Hollywood Casino Amphitheatre. The show was played in hot and stormy conditions including lightning. As shown below along with the rainbow that followed. Phil played with Tesla for a second time during their opening set. "Thank you. Thank you very much. Boy it's a hot one. As usual. Feel free to disrobe. He's here!. No, much later. No more jazz. Thank you. No, this boy here. All the way from Northern Ireland he comes. He puts the fast in Belfast, he does. Can you make a lot of noise please for a very happy and healthy Vivian Campbell!." "Thank you. Thank you very much. How we doing?. Are you okay up there?. Up at the back. How we doing in the back?. A friend of ours who we haven't seen for a long time came to visit us today and he brought some old photos which reminded me of the fact that it's 36 years since we first played St. Louis." "I remember it well. Well, I remember a certain girl at the arch but that's a different story. But 36 years ago and look at this. Saturday night. Amazing!." "Thank you. Thank you very much. Just one more look all the way to the back. Let's have a look at you. We've only got three shows left before we take a little break. So we can take this one away with us as an amazing memory. Remember when we used to get the lighters out?. How about you get your cell phones out. Let's have a look at you, see what it looks like come on. Give yourselves a round of applause!. Hard to do with you phone in the air isn't it?. Wow that's amazing guys, thank you so much." "This is one of the reasons that we like to keep coming back here. A lot of you people have been following this band for a long time. So you know the kind of trials and tribulations that any band can go through. Whether you've been together as long as we have. But the spirit you need to keep rising up. Well nobody epitomises it more than this boy at the back here. Stand up Rick Allen!. And as ever he will introduce this one for ya." "St. Louis. Thanks for having us. Thanks for coming. Thanks for being here. We'll see you next time. Goodnight!." "Amazing. Thank you so much. Until next time. And there will be a next time. Do as a big favour yeah. Don't forget us and we won't forget you. Goodnight!." The next show takes place on 29th August in Cleveland, OH. Played for the first time in St. Louis.